A lovely diamond accent sterling pearl ring created with a 7-7.5 mm white freshwater pearl set in a sterling filigree wire setting with your choice of 2 mm diamond or classic moissanite accents on each side of the pearl. 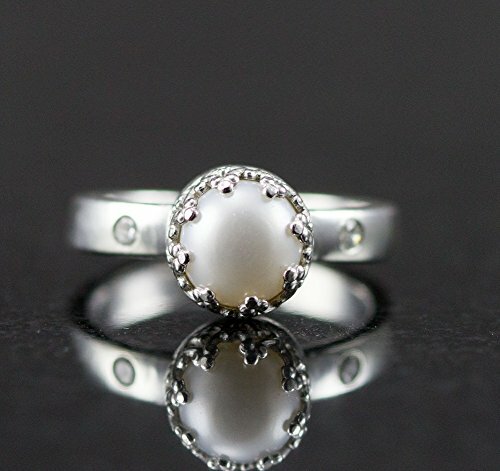 This ring is so special and elegant, it makes a wonderful pearl engagement ring or very special June birthstone ring! Please be sure of your size before ordering. If the ring is a gift for someone, please get them properly sized at a jeweler or department store. It is extremely difficult to re-size a ring with flush set stones and not ruin the integrity of the setting, so please make sure you get a correct size! Ring is available in sizes 3-12 and all increments with your choice of finish. Custom requests are welcome for different accent stones including birthstones and eco-friendly lab created stones. Last photo is an example of the oxidized finish with a different band style. All my jewelry is packaged suitable for gift giving. I include a drawstring storage pouch and a square of polishing cloth with each order so you can add some extra sparkle to your jewelry before wearing. If you have any questions about this product by All Wired Up Jewelry Designs, contact us by completing and submitting the form below. If you are looking for a specif part number, please include it with your message.